I got word last week that the interpretive signage at the crash site of B-24 "Milady" on Cox Peninsula west of Darwin is being renewed and the site restored. I will let you know when this project is completed. I did the signage for this way back in 2002 and had forgotten about it but I attach a painting I did of "Milady's" action (see Glenn Horton's Best in the Southwest) for your interest and the 380th files. I happened upon the 380th web site and appreciated seeing it. Noticed that dad's name was spelt Clemeau - if possible could you please correct to Clemow. And yes he went on those "impossible" long runs to bomb Balikpapan and shipping. After training at Parkes New south Wales, as wireless operator and navigator, Fred had a fairly quiet opening to the war flying in Avro Ansons on anti submarine patrols from Laverton in Victoria with 67sqn. His identical twin Bill (WJ Clemow) copped the rough end of the pineapple, going to the UK after further aircraft training in Canada. 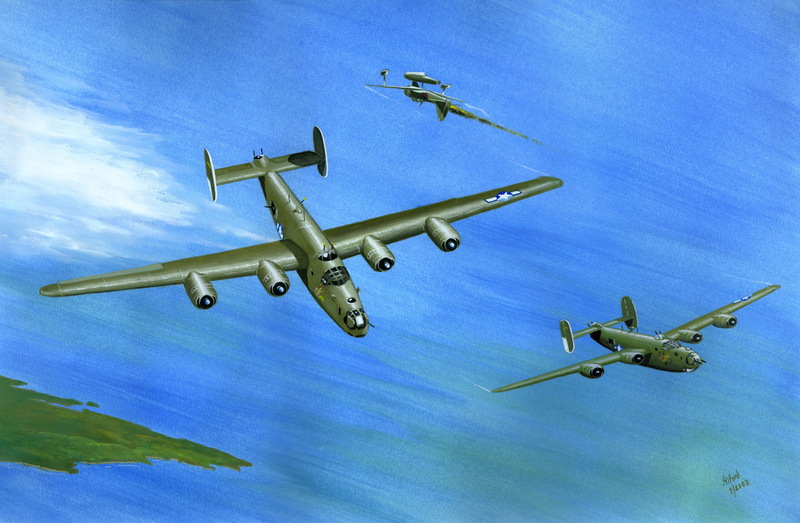 While serving with RAF Sqn221 was kia 27 April 1943 over the Mediterranean near the Sicilian straights. After this Fred couldn't get into European theatre due to the Japs being Australia's priority but he transferred to Liberator training when the opportunity arose. As I understand it Fred & Adam Gillespie hit it off upon their first meeting and flew together for all but a couple of missions. Fred also took hundreds of photographs of island terrain, shipping, aircraft, destruction after bombing runs and the troop landings at Balikpapan, some of which are in his album. My name is Carl James Baldwin. I am the son of Caroline Jean Holt. My uncle is James Carl Holt. My uncle's plane went down near Ceram Island, an island in the Moluccus Group. Would anyone have any information about my uncle? This appeared in the local paper, would anyone know Lt. J.B. Hershberger? Mrs. Carl Holt of Sherman Avenue, has received a letter from Lt. J.B. Hershberger, a member of the crew of the bomber on which her son, Sgt. James C. Holt, was a radio operator. The information gives her great hopes for the safety of her son, reported missing in action in the South Pacific May 8, while serving at Ceram Island 1,000 miles north of Australia. Lt. Hershberger, who was not aboard the plane because of a mangled foot, said that information brought back to camp was that the plane made a water landing when only 30 miles from land and could have drifted to land as there was land on four sides of them. Lt. Hershberger is enroute to the states and he advised Mr. Holt that he will give her further information when he arrives. Any information anyone has would be appreciated. 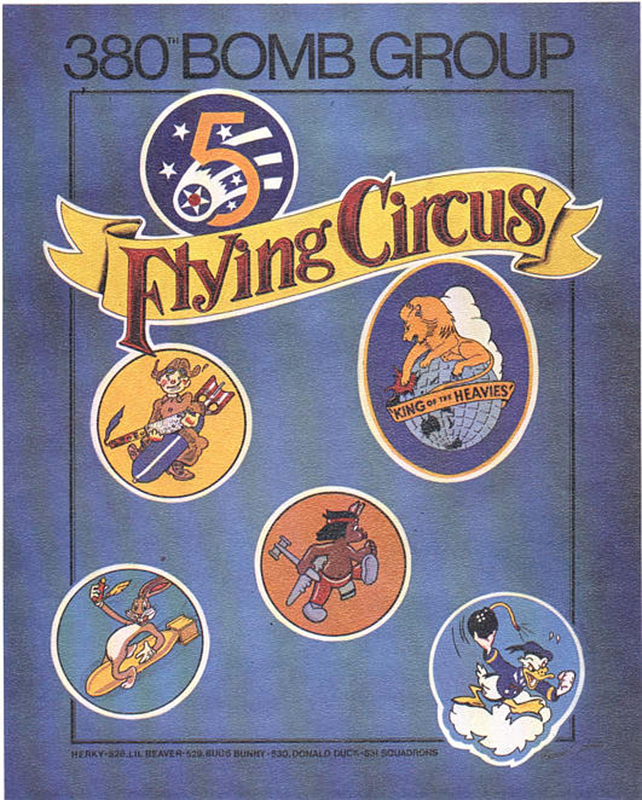 I'm searching for the origin of the use of "Herky the Clown," mascot of the 528th. Any leads would be appreciated.